Since a year The Hague is the city where I work and I actually did not know much about this city. It is the political capital of the Netherlands, but it never interested me somehow. In my head The Hague was a bit lame, petty and boring. Not a city with a hipster image I thought. 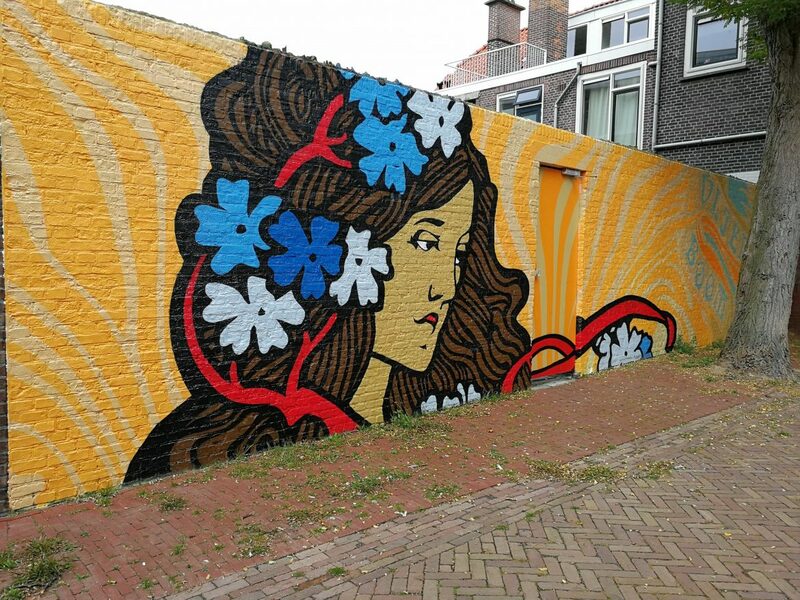 Until I decided to read up on The Hague and I discovered The Hague Street Art Tour. 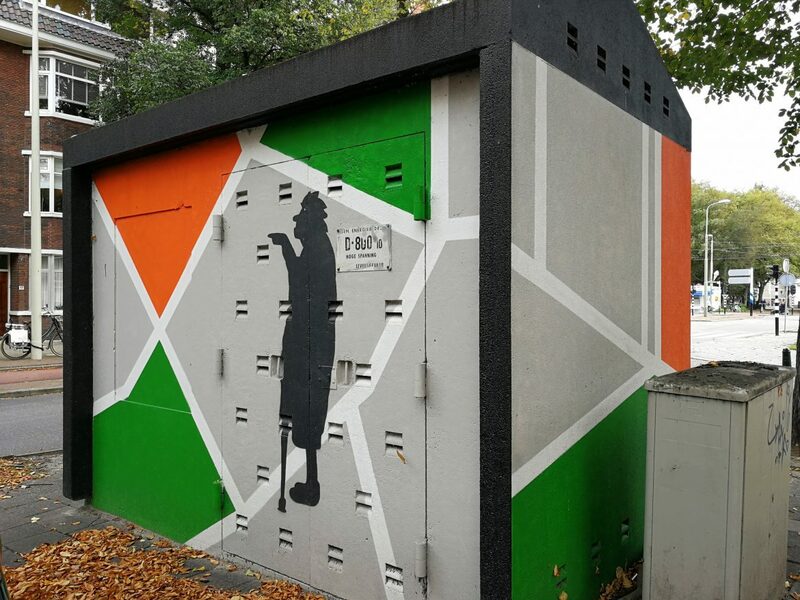 This is an art project that painted 2000 square meters of electricity houses and walls with street art. Well yes, now you got my attention. Last winter (2017) I explored The Hague for an afternoon to discover the street art side of this city. I absolutely loved this new way of using public space objects for art and making art even more part of everyday life. The Hague district of Segbroek is located on a half hour walk from the city center. 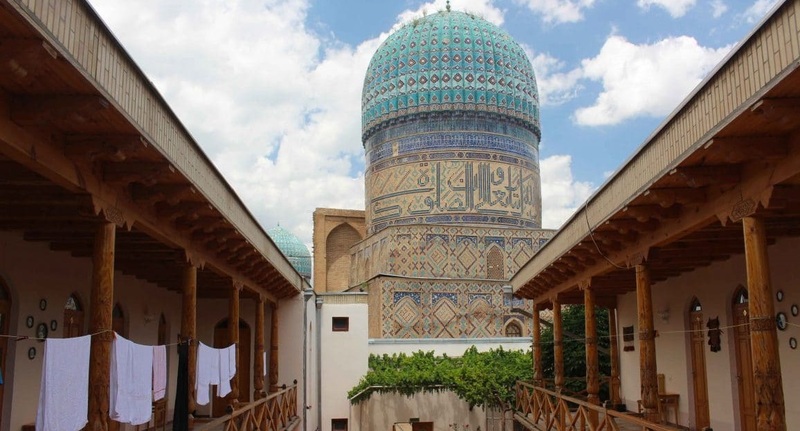 It is a residential area like every other, until you notice the details. Almost all electricity houses have a special and colorful look. 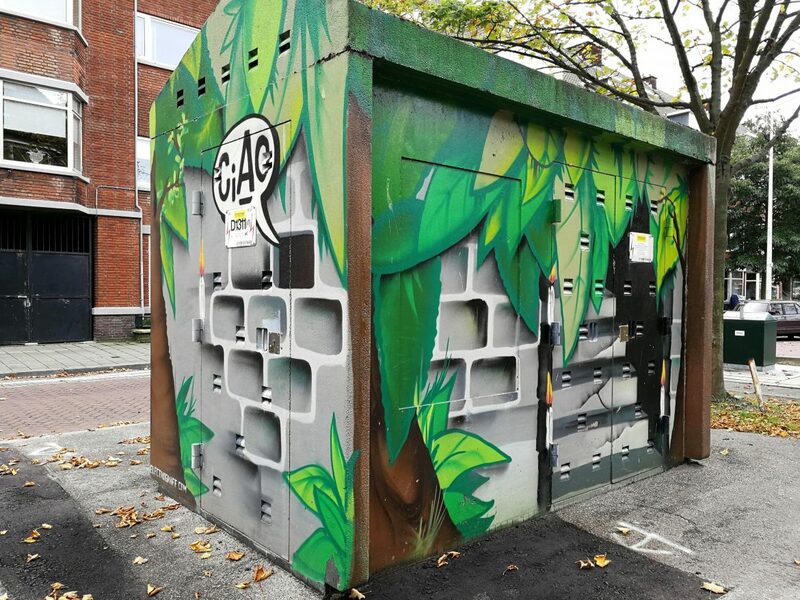 The best way to search for the electricity houses is by using the mobile routes of The Hague Street Art. 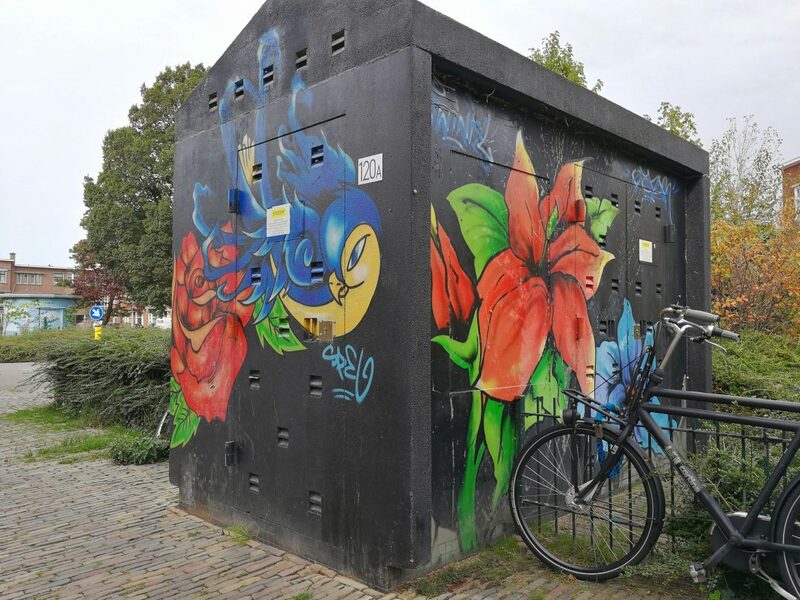 It is very easy: you go to the website of The Hague Street Art Tour, you choose whether you want to walk or go by bike and you select how long you want to explore. And then you hit the Let’s Go button and the mobile tour starts. 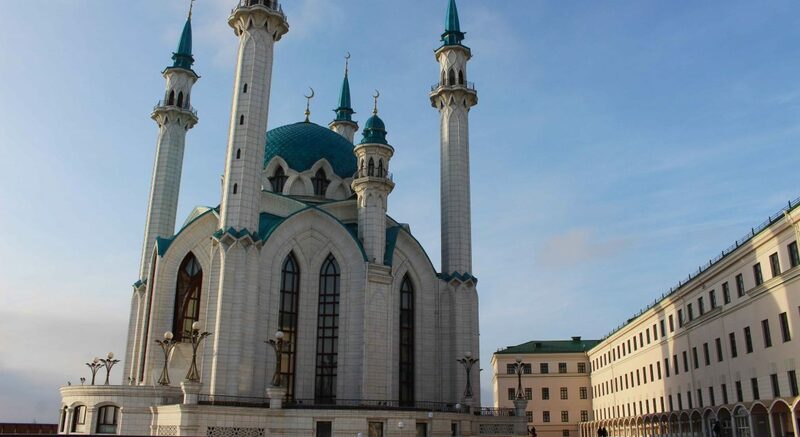 I chose the 45-minute tour and I saw 10 colorful electricity houses. I am not sponsored to say all this; I am just a fan and want to help others to make things a bit easier in life. 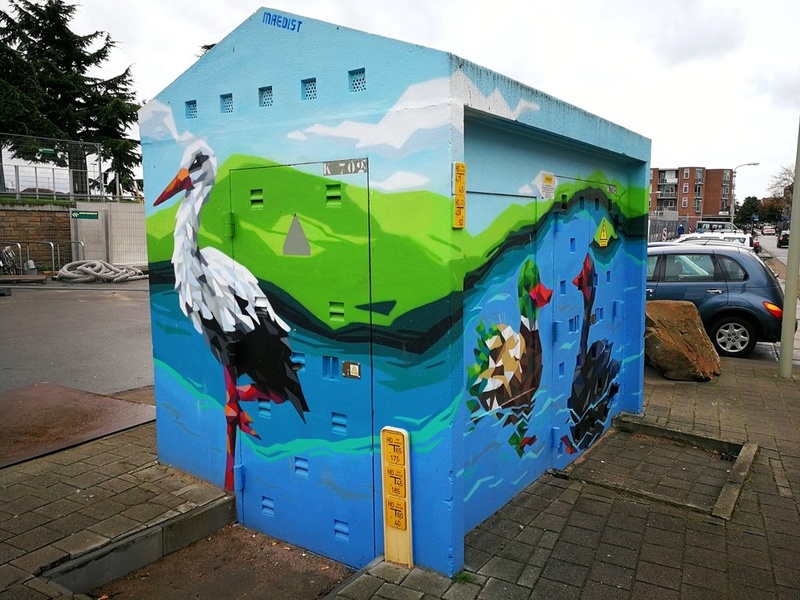 In the district of Segbroek the electricity houses are the canvas for many works. Why do you ask? Electricity houses are by definition uninspiring objects that nobody cares for and are therefore often the target for tagging. 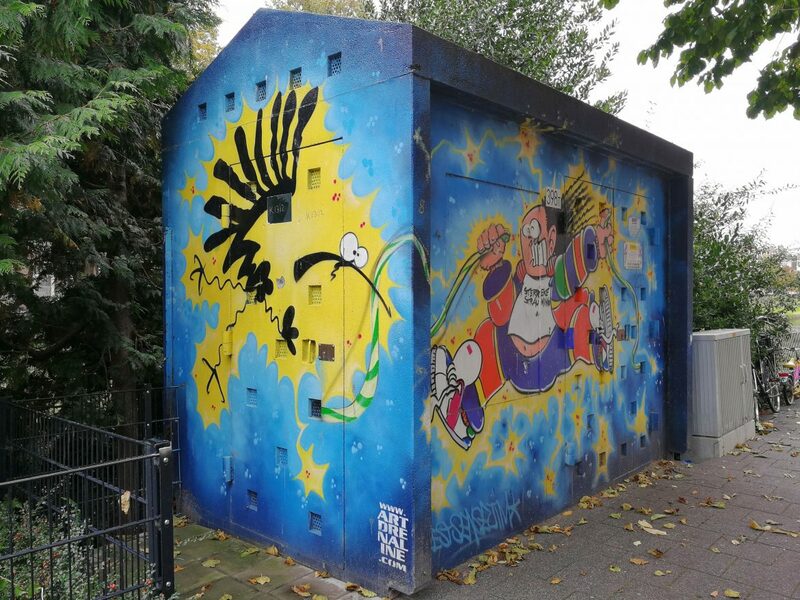 The art project, in cooperation with the Municipal Museum The Hague and the city council, is aiming to prevent illegal graffiti and vandalism. 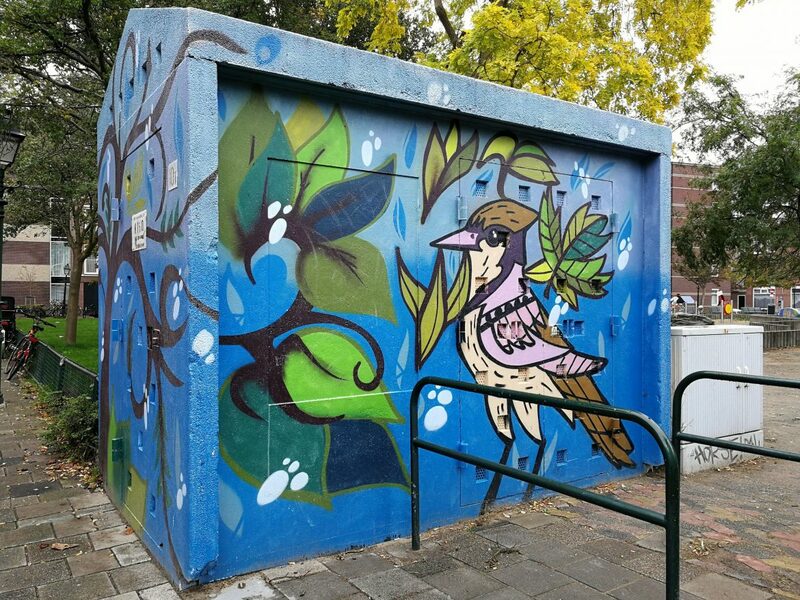 With this project the electricity houses are turned into art pieces and create a more inspiring area for the neighbourhood and its residents. Moreover, you almost see no vandalism anymore, because you do not mess with the work of artists. 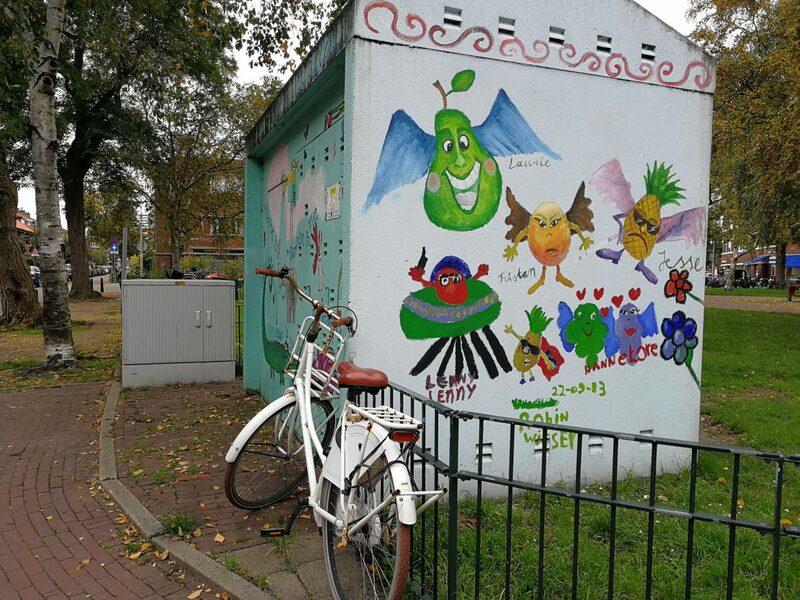 In Segbroek you can find nearly 40 works of art, most of them created between 2009 and 2016. 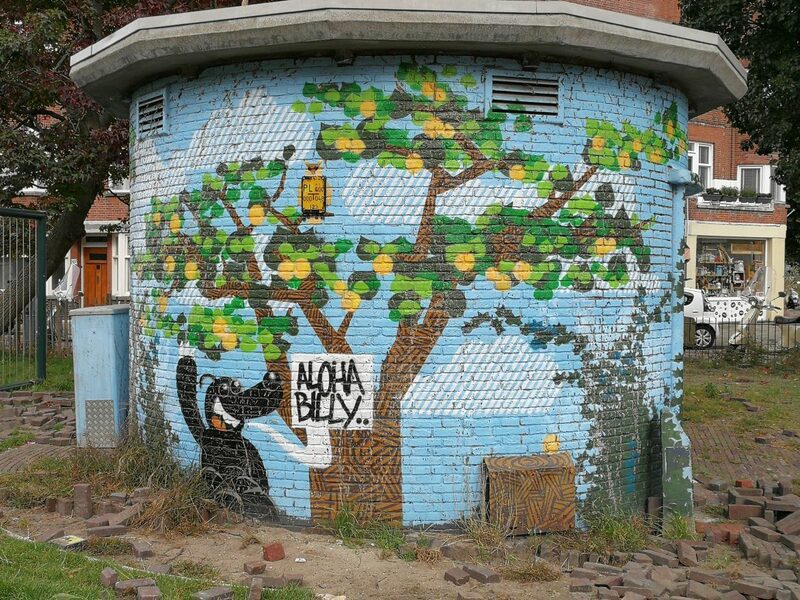 According to The Hague Street Art it is even the largest public exhibition of The Hague. The designs are meant to brighten up the neighbourhood and they often have something to do with cartoons. For example, the electricity house at Valkenboskade is inspired by the cartoon character ‘Haagse Harry’, a Dutch comic from the nineties. Some houses have a more of an abstract design. 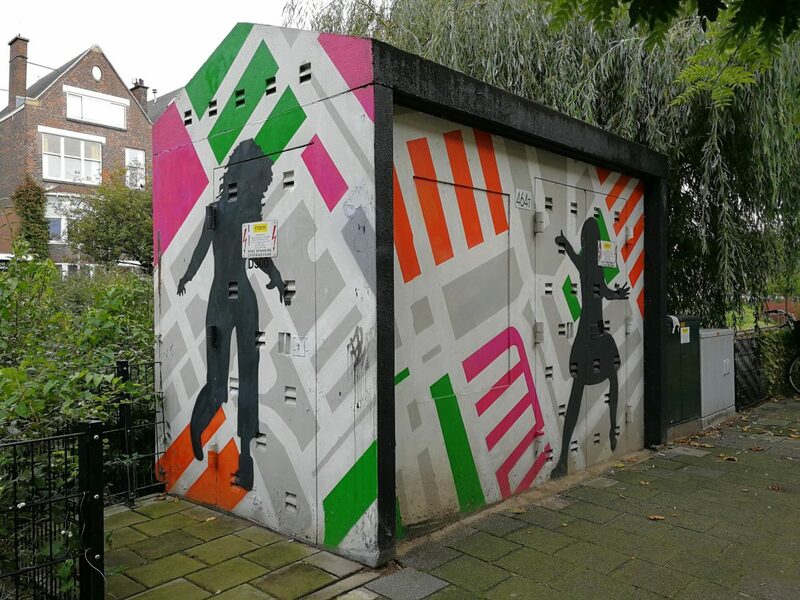 Artist Leo created a set of four houses with the city map of Segbroek as the artistic underground. The moral of this story: almost every type of wall can be used as canvas for street art. 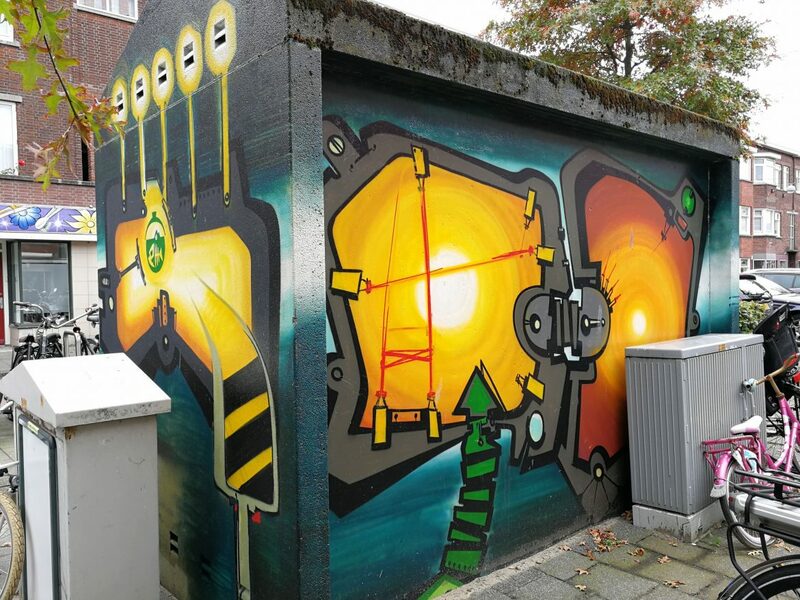 It is nice to see that The Hague is using street art to brighten up an area and trying to prevent vandalism. 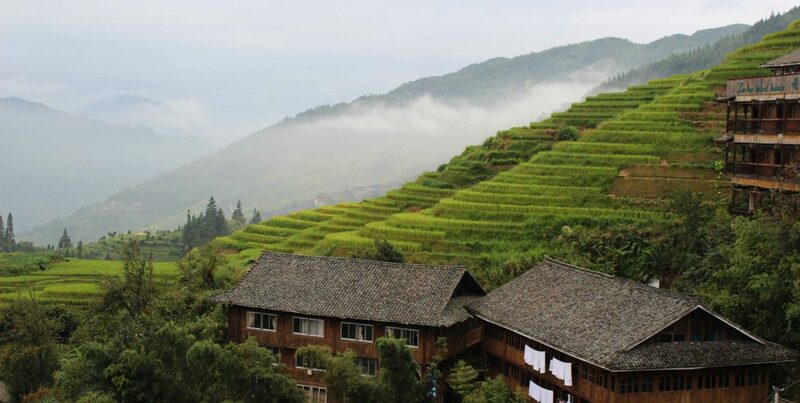 A number of works are also created with the help of the local residents. 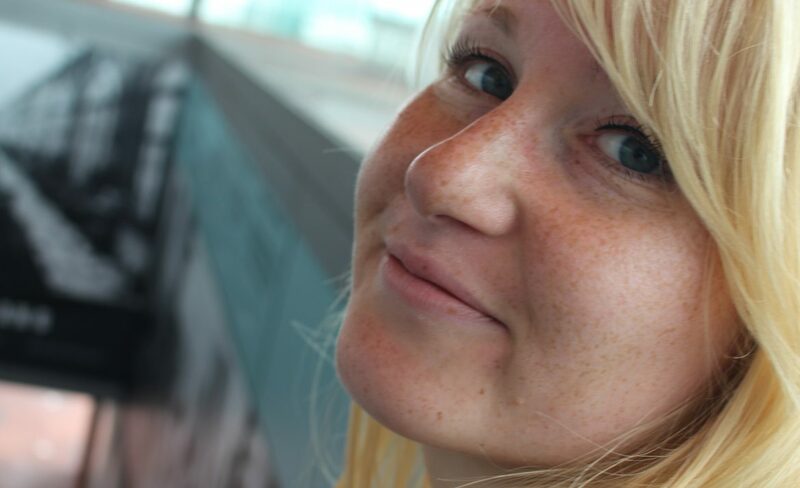 Hopefully more of these types of projects will follow in the Netherlands. Besides electricity houses there are also some nice wall paintings along the routes. What is the most special type of street art you have ever seen?